Visions of Jesus Christ.com - Doctor Margaret Pasakas used her stethoscope on the heart of the Missionary Image of Our Lady of Guadalupe and heard a human heartbeat. Doctor Margaret Pasakas used her stethoscope on the heart of the Missionary Image of Our Lady of Guadalupe and heard a human heartbeat. 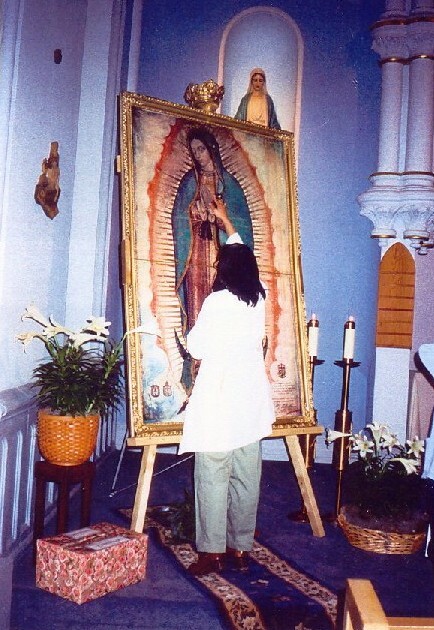 May 23, 2003 Doctor Margaret Pasakas placed her stethoscope on the heart of the Missionary Image of Our Lady of Guadalupe at St. Joseph Hospital in Reading, Pennsylvania. To her utter astonishment she heard a human heartbeat and knelt down [See here] in tearful veneration.